But first I went to the zoo in Montpellier! Because it’s free! Hooray! But then I went to Madrid. Highlights include nom-tastic tapas, even more nom-tastic chocolate y churros, the Prado and its current Renoir exhibit, 2-euro scarves at the rastro, and the absolutely wonderful apartment where we stayed thanks to AirBnB (the only way I will ever travel from now on, if I can help it). But mostly it was great to see Cate and Sara and catch up with them and be ridiculous. Madrid! aka, tour guide love in España. In other news, I registered for classes, which was yet another abrupt reminder that my time here is coming to an end all too soon. BUT I am actually feeling pretty ok about my schedule. I’m not able to take the one engineering class that I was pretty stoked about, because it’s actually not offered this quarter (bummer), but that means I have room in my schedule to take a French class. Even though it’s ‘Topics in 17th Century Literature,’ which to me sounds less than thrilling, I’m stoked that I’ll have an opportunity to keep speaking French when I return to the states, rather than going from here to zero. And plus, I don’t have class before 11—excellent. And I’m excited to be back in orchestra, too. So we’ll see. a) Epic strikes in France! The university was blockaded and there were all sorts of marches and crazy shenanigans. Everyone’s up in arms about Sarkozy. b) we went to Carcassonne in October with the program. It’s a medieval walled city, and the inside looks just like Hogsmeade out of Harry Potter. So legit. c) We had Fall Break! I went to London and Cork, which were planned. I also ended up visiting Frankfurt and sleeping overnight in the airport, thanks to a plane snafu (a story which is really long and which I’ve already recounted enough times to make me sick to death of it). It was cool to see touristy things and all that, but mostly it was just nice to see my dear dear friends Megan, Carly, Deeya, and Drigan. Fall break: London, Cork… and Frankfurt? Elyse: How is it mid-October? The realization hit me a couple of days ago that I have only two months remaining here in France, which means I’m about 40% of the way in. WOW. Montpellier is no longer new to me; more and more, I know my way around the city, both literally and figuratively. My classes are in full swing and I have a rhythm and routine now that I didn’t at the start of the semester. Last weekend, my friend Cate from the tour guide office, who’s studying in Madrid this year, came to visit. It was so so so great to see a familiar face and to be able to show her around Montpellier (and make lots of corny tour guide jokes!). It made me even more excited for my upcoming travels to see friends: London in two weeks, Ireland, Madrid, and Paris. Also! This is exciting: I’m getting a viola! I didn’t bring my viola with me to Europe because it’s pretty bulky/inconvenient, and I didn’t know if there would be any opportunities to play in an orchestra or something like that here. For the first few weeks, I didn’t give it a thought at all because I was so busy adjusting. But the past few days or week, I’ve been going a little nuts missing playing music. I’ve been listening to classical music nonstop. I’ve been dreaming about playing. It’s the most bizarre thing, but I guess it’s to be expected since this is the longest I’ve ever gone without playing. So I decided to go ahead and look into the options for renting an instrument here, just for my own personal satisfaction. I can rent a viola from a luthier here for 22 euro a month! I’m so excited. I’m going back tomorrow afternoon to pick it up; I’m just going to take it for a month now to see how things go. Even just quickly running through a scale on it today to check the size made me feel like I was back where I wanted to be. I’m a little nervous to see how much my skills have decomposed in the last two months, but at least this way I’ll be in better shape when I come back to the states in December! Anyway, that’s what’s new with me. I know I haven’t posted in a few weeks, but that’s mostly because in general I’d rather be out doing things than writing about what I’m doing. Hopefully pictures to come soon — haven’t taken many lately, but maybe I’ll change that. Today, I went on a day trip with the program to Anduze, a small village about 1–1.5 hours from Montpellier. We visited an enormous bamboo forest, lunched in the town, then visited a nearby cave. Check out pictures here. All in all, an excellent day, but tiring—I woke up at 6:45 (yuck). I think it’s time for a brief nap. People hang out all the time here. It’s something that I’m unaccustomed to at Northwestern, where it’s really difficult to find time for anything other than school or work during the week. Here, I’ve spent time with my host brother and his friends almost every single day, which is awesome, because it means that I have a lot of opportunities to practice actually having real-life conversations in French. 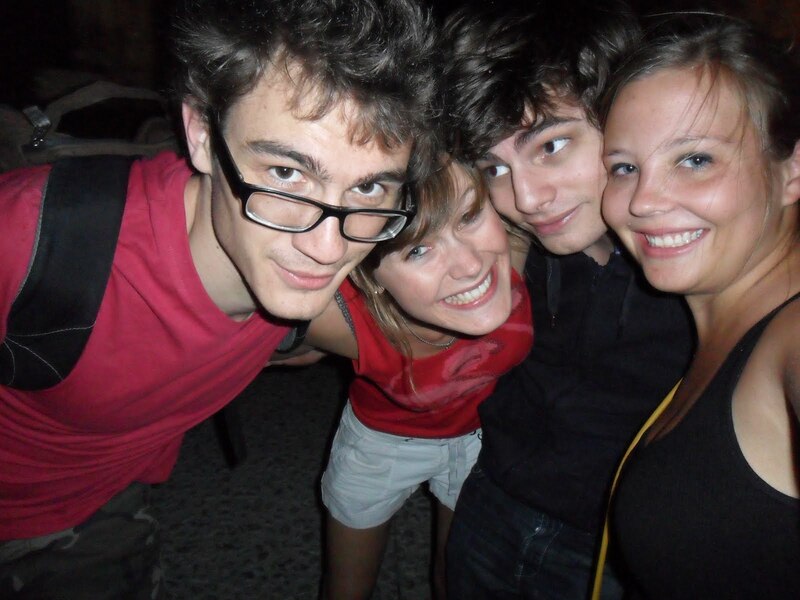 The picture is with my host-brother, Clément (left), and his friends Pauline and Lucas. We were at the Féria, a huge festival in Nîmes, which is maybe a half-hour drive from where we are here in Montpellier. I’m so lucky to have a host-brother my age who’s super-nice and willing to bring me along to hang out! In between all the afternoons at cafés, evenings lingering over dinner, and nights exploring Montpellier’s many student-friendly bars and discothèques, I have also been going to class (don’t worry, mom and dad!). I’m taking five classes: grammar, phonetics, conversation, translation, and history. Though I’ve had just a week of class so far, I’m already enjoying all of them. The best part is that everything I’m learning in my classes is immediately applicable and/or relatable to my life outside of class, which is something I never really experienced with my French classes in the US. Here, when I learn about 18th century France in my history class, I can walk down the street and see the buildings that were built then. I can study a certain type of sentence construction in grammar and then use it when I’m chatting with my host-mom at home. And vice-versa: all the practice I have speaking French and being immersed in the culture also helps me get the most out of what I’m learning from my professors. It’s awesome, and already I can tell that I’m learning tons. This week has flown! I’ve updated my picasa album with more pictures… you can check it out here. I’m starting to make French friends, which is very exciting. My host-bro and his girlfriend are super-nice and have been inviting me out with them. It’s so good to have French friends like them who are willing to speak slowly enough and/or repeat things so that I can stay on top of the conversation. My classes start next week. I’m still not entirely sure what my schedule will be, since I registered for more classes than I will eventually take. I’ll be able to sit in on all the classes during the first week, then decide which ones to keep. Although I’m sort of dreading the start of class since it means I’ll have less free time to spend with friends and to explore the city, I’m excited to experience the French educational system and to get back into academics. I may also be taking yoga through the university (!) which would be very exciting. Tonight, after dinner, I had a long conversation with my host-mom’s copain, Sol, which covered topics including my family heritage, the Columbian exposition in Chicago, Glenn Beck, what I should do in Barcelona when I visit, and banana bread (which apparently doesn’t exist here). Talking to Sol is great because he’s very interesting, but it’s also exhausting because he’s a stickler for grammar and always corrects my errors… That’s definitely a good thing, too, but still fatiguing for me. Fortunately, though, I can feel my language skills improving every day. I arrived in Montpellier Thursday afternoon, where I met up with other kids on the program. The program comprises about 35 students (including just four very brave males), and it’s a good mix of kids from University of Minnesota, which administers the program, as well as other universities. Thursday afternoon, some of us wandered around Montpellier, successfully ordered and ate dinner at a crêperie at La Place de la Comédie, which is a large open area in downtown Montpellier, just a few minutes’ walk from the hotel. Friday we had orientation at the program center, then hopped on a bus to head to Le Grau-du-Roi, a seaside resort on the Mediterranean. Friday night we went to a traditional bull ranch, where we toured the ranch on a wagon and also got devoured by mosquitos (les moustiques—a word we all will never forget). At the ranch, we were served a traditional southern France dinner, and afterwards there was a dance party in the barn, where musical selections included 80s europop, 80s American rock, and a techno remix of the Pirates of the Caribbean theme song (?). Oh, sidenote, our middle-aged French bus driver’s ringtone was ‘Girls Just Wanna Have Fun’. Quality. Saturday we went downtown into Le Grau-du-Roi, where we went on a catamaran out onto the Mediterranean, then had the entire afternoon to ourselves in the town. Two friends and I lunched at a beachside café, then relaxed sur la plage for the rest of the afternoon. In the evening, we had dinner at the resort’s restaurant. This morning, we went to a museum of ancient Roman ruins in Arles, then hit up the medieval walled city of Aigues-Mortes, where I had the most splendid lunch with some friends. Finally, after visiting the Tower at the corner of the city and walking along the top of the ramparts around the entire perimeter of the city, we headed back to Montpellier. Tonight I met my host family. They’re really really nice and live in a large house just 10 minutes’ walk from the university. I have a host-mom and host-brother in the house; Marie is an allergist, and Clément is my age and in medical school here in Montpellier. Clément’s petite amie, Diane, was here for dinner as well, and they invited me to go to the discothèque with them on Wednesday, so that should be fun. It’s been an absolutely crazy four days, and I’m so happy to be relaxing in my gorgeous room here. It’s amazingly draining to be immersed in another language, even more so than I was expecting. In order to understand anything that’s going on around me, I have to be constantly focused on each word, and also taking in context and gestures in order to make sense of what’s going on, particularly because people here tend to speak quickly. But I think I’m doing ok and have been able to communicate with the people around me. I have to admit, I’ve been using a whole lot of present tense and have been randomly inserting infinitives into my sentences… but I’m hoping the grammar will fall into place once I’m more accustomed to everything else that’s going on. Here’s a link to my Picasa album. Check it out. The captions describe the places we’ve been so far. Enjoy. And I am going to go enjoy a full night’s sleep in what will be my room for the next three months! You are currently browsing the archives for the Elyse in Montpellier category.